RePub, Erasmus University Repository: Path Dependence and Universal Health Coverage: The Case of Egypt. Path Dependence and Universal Health Coverage: The Case of Egypt. Universal health coverage (UHC) is the big objective in health policy which several countries are seeking to achieve. Egypt is no different and its endeavors to attain UHC have been going on since the 1960s. This article discusses the status of UHC in Egypt using theories of political science and economics by analyzing the historical transformations in the Egyptian health system and its institutional settings. 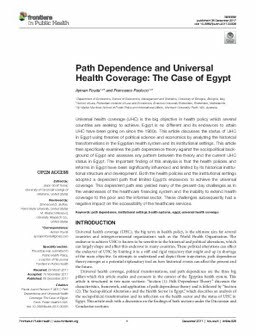 This article then specifically examines the path dependence theory against the sociopolitical background of Egypt and assesses any pattern between the theory and the current UHC status in Egypt. The important finding of this analysis is that the health policies and reforms in Egypt have been significantly influenced and limited by its historical institutional structure and development. Both the health policies and the institutional settings adopted a dependent path that limited Egypt's endeavors to achieve the universal coverage. This dependent path also yielded many of the present-day challenges as in the weaknesses of the healthcare financing system and the inability to extend health coverage to the poor and the informal sector. These challenges subsequently had a negative impact on the accessibility of the healthcare services.